Create and track structured, hierarchical requirements data. 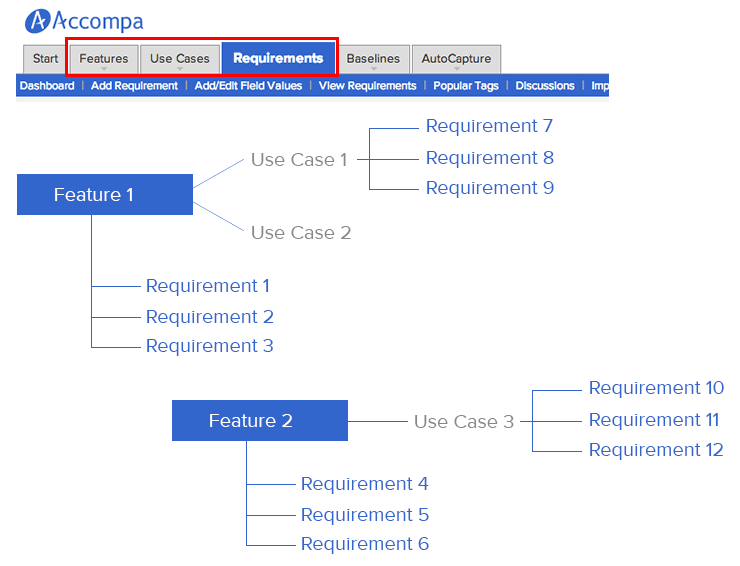 Accompa enables you to track Requirements, Features, Use Cases, and other custom requirements artifacts. Manage hierarchical requirements data – Features, Use Cases, Requirements, and more. Create custom artifacts. Accompa enables to track custom artifacts – such as personas, test cases, and more. Trace relationships & dependencies. Create relationships and trace dependencies to ensure coverage. Create and track requirements, features, and use cases. Furthermore, you can easily define custom attributes to track – in order to meet your organization’s unique needs. Track any type of requirement you need to track – business requirements, market requirements, functional requirements, performance requirements, and other non-functional requirements. Unlike software from many of our competitors, Accompa enables you to define and track custom artifacts – such as personas, scenarios, test cases, and more. “Custom objects” feature enables you to manage any artifact you’d like! Easily define relationships (also referred to as “links” in requirements management literature) between your requirements data. Perform impact analysis to identify the impact of changes. Easily create traceability matrix to analyze relationships/links between your requirement artifacts, and ensure coverage between different types of requirements.